Are you putting enough pressure on your opponent in the opening? Are you winning games in the first 15 moves, or at least gaining a large advantage? This guide is guaranteed to provide you with a comprehensive, well-researched set of chess gambits for all main lines with the white and black pieces! Are you putting enough pressure on your opponent in the opening? Are you winning games in the first 15 moves, or at least gaining a large advantage? Do you ever try an aggressive opening and sacrifice a pawn, only to fall into your opponent’s opening preparation and go straight into an inferior middlegame/endgame? You will find more details below about the 9 volumes with 30 hours of high-quality chess instruction by a diverse mix of experienced Grandmasters. GM Lemos goes far and beyond the average chess video presentation, not focusing on specific move orders but rather making sure that his viewers understand the main ideas behind the moves in the Fianchetto Variation. Viewers are guaranteed to walk away from this DVD with not only a greater understanding of how to beat the Benko Gambit, but a greater understanding of positional chess in general. As a 2550 FIDE GM, Damien Lemos bases his high-level play around superior strategic play and deep maneuvers, and in this chess video GM Lemos imparts his positional wisdom with exceptional clarity. ¨Battling the Benko: The Fianchetto Variation¨ examines all of the main lines and sidelines, with optimal plans for white provided in every variation. If you play 1. d4 and consistently struggle against the Benko Gambit, this chess video will teach you a complete system to improve your results with white. If you are considering playing the Evans Gambit, you must understand the basic principles behind this complicated system – black will win material very early in the opening and he will be able to hold this extra material, however white will definitely obtain sufficient compensation in the form of very rapid development and a lasting attack in the center and kingside. If you are looking for a chess opening for white that will grant you excellent winning chances, dynamic positions, and strong attacking prospects – the Evans Gambit will be a perfect fit for your repertoire! This chess volume is targeted at beginner and intermediate chess players as GM Har-Zvi first introduces the main concepts of the Smith-Morra Gambit and later delves deeper into concrete variations. GM Har-Zvi also explains common tactical patterns that you should always be aiming for with the white pieces, as black will be facing considerable pressure in the center – especially on the C and D files from white’s active rooks! This chess volume is guaranteed to improve your results with deep preparation of an explosive gambit against the Sicilian Defense! This chess volume focuses on common chess gambits for white in various king pawn opening systems, and is guaranteed to not only enhance your preparation with the black pieces in these dangerous sidelines – it will also increase your overall level of chess understanding as GM Mikhalevski clearly presents his ideas via a concept-based teaching approach. Grandmaster Victor Mikhalevski explains how viewers can dominate with the black pieces against the Scotch Gambit, Goring Gambit, and Danish Gambit. These three gambits can be extremely dangerous if you are caught unprepared, and it is very easy to lose yourself in the complications early in the opening and lose in less than 20 moves! GM Mikhalevski demonstrates how black can convincingly defend himself and fight for a long-term material advantage with conceptually based defensive schemes. GM Timur Gareev is an American Grandmaster who was a part of the University of Texas at Brownsville’s chess team from August 2005 to August 2006 and also from August 2009 to December 2011 where he helped the university obtain its first national championship. This volume for Intermediate to Advanced Players looks at the variations associated with h4 in the Grunfeld and is termed ‘The Grunfeld Gambit’ by Gareev as he often sacrifices the Pawn with h5. 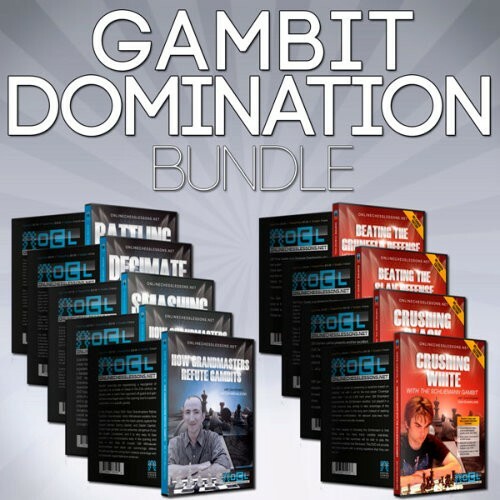 This volume for Intermediate to Advanced Players looks at the variations associated with 7.g4 Gambit against the Semi-Slav Defense, in an attempt to prove that it is a good way to strive for the win with White. The volume is very thorough in content with a plethora of ideas supported by exact detailed Grandmaster analysis. After watching this DVD you will have a superb way of dealing with Black’s Semi – Slav efforts and have confidence in this area when pushing forward your d Pawn at move one. Crushing Black with the King’s Gambit is the most direct way to attempt to acquire the advantage versus 1…e5 players. GM Lemos promotes the virtues of the most attacking 3rd move namely 3.Bc4 and puts forward a strong argument that is the best 3rd move available in The King’s Gambit Accepted. This volume is aimed at presenting a repertoire based on meeting 1. e4 with 1… e5 for the club player. Coverage starts after 1. e4 e5 2. Nf3 Nc6 when GM Shankland recommends the Schliemann variation, but played in a more classical way, aiming to take advantage of the extra central pawn in the long term instead of seeking immediate confrontation. All relevant side-lines from move 3 onward are also covered.